The missus takes a phone call in the morning, she says it is a man named Geoff for me. A call up to the England side! Finally, the hard work over the past couple of years has paid off. I only manage to make the Test squad, which seems a bit odd as apparently Saj Mahmood is in the ODI squad. Oh well, can’t complain. Arrive in South Africa early due to injuries, just in time to see old horse face get smashed all round the park in the one dayers. Nobody else does much better. Heh heh heh. I am bound to have climbed up the pecking order now. Andy sits me down, and says I have just missed out on selection for the first test. Oh well, I can’t be too far off a return now. He encourages me to keep working at my game, so I buy a stump, head to the nets and work on hitting the top of it. Still no game. I have managed to keep busy for the past few weeks by bowling at one stump a lot and dicking about with walkie-talkies whenever the camera is on me. Jimmy has a bad knee and Stuart keeps swearing at umpires, so it feels like I will be getting a game soon. Rumour has it that Onions is tired, and will be missing out on the last test. Brilliant, this has to be my chance! They picked Sidebottom. Jesus wept. England bowl a load of old tripe and lose. Obviously. All the while, my line and length at one stump is quite fantastic. I must be getting close to a game now. The selectors have obviously seen the error of their ways, and have picked me for all three squads to go to Bangladesh. Excellent, all this extra work over the winter is paying off! Colly is moaning about the golf courses on the sub-continent, but I won’t have time for that with all the cricket I will be playing. The final Twenty20 was today, but still no game. Someone called Amjal opened the bowling in the last game. I don’t know who he is. Andy and Cookie haven’t spoken to me for a few days now. They must be saving me for the one dayers. The one dayers started today, but my name wasn’t on the list. Sidebottom seems to be playing again though. I go and get my stump. Finally pluck up the courage to ask Andy why I’m not playing. He seems surprised to see me, but promises me a game if we win the second ODI, which we do! My chance to shine! Slightly worried that my name is down as “Lee” on the teamsheet though – must be a printing mistake. 2 overs! 2 ****ING OVERS! Amjal comes in, opens the bowling, goes at 6.11 an over and gets 9 overs. Having traipsed around carrying KP’s bag all winter, I go at 6 and get 2 overs. Not only that, they put me down to bat at 11! And Pietersen bowls my other 8 overs! Everyone is injured, so I am guaranteed a start in the test matches. We even have to draft in some tall guy called Steven to make up the numbers for the tour game! I bowl pretty well, and feel confident that my international career will begin again on Friday. People keep interviewing Steven. I don’t know what this means. I actually laughed out loud at this – (sorry, Liam) – people at work think i am (more than) an idiot. Oh well, back to the stump. Well, he is nicknamed “Pudsey”. Maybe, just like the bear, he is just a very good mascot! Hmmm you could be right there, he is being treated a bit like a mascot. They should just let him go and do pre season with Durham now, I think he has lost the form he had at the end of the season, cos he has played no cricket and like Harmy he needs to play! Right now I would guess he is as capable of being as crap as Mahmood. 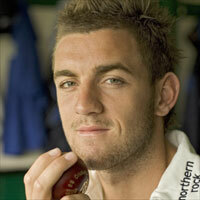 If in form Pudsy is better than a fit Sidebottom – but Sidey is a better bowler day in day out. Not only form. His confidence, which had taken about 2 years to build up again, must be shot to pieces again now.